Alain Ducasse, iconic chef and author of Simple Nature, presents a collection of recipes from his worldwide network of French bistros Allard (in Paris), Aux Lyonnais (Paris), and Benoit (Paris, New York, and Tokyo). A relaxing, convivial alternative to haute cuisine, bistro cooking most closely approaches the British gastropub or Italian osteria tradition, with less formal dishes served with local wine. Ducasse and his team of chefs have reengineered these casual classics with a contemporary eye, giving them subtle twists and a lighter, healthier profile. 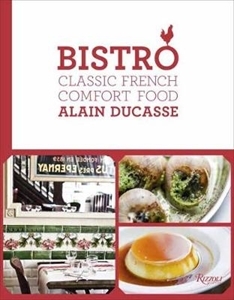 Recipes include the French country cooking we all love to order in family eateries, including oeufs cocotte, pate en croute, blanquette de veau, sole meuniere, classic French onion soup, and of course mousse au chocolat and poires belle-Helene. Expert instruction for approachable recipes will have you cooking like a French chef, delighting family and friends with delicious, modern versions of classic bistro fare.